It still stands—a sturdy, stone sentinel once standing watch over the settlers below—settlers swarming into the community of “Cleaveland” created by the confluence of the Cuyahoga and the Lake. It still stands—a home of stone hewn from the same quarry that helped spur Northeast Ohio’s economic expansion by providing sandstone for the breakwall protecting the port of Cleveland and for the locks of the Ohio and Erie Canal. Through the tragedy of the Civil War, the national expansion of the Spanish-American War, the optimism of World War I, the shattered dreams of the Great Depression, the national unity of World War II, and the disunity that has followed—it still stands. From Zachary Taylor, Abraham Lincoln, and Teddy Roosevelt to Kennedy, Reagan, and Obama—through the administrations of 32 U.S. Presidents—it still stands. Built with solid stone block cut 30 inches thick for the basement and 14 inches thick for the walls—it still stands. For over 165 years, the Henninger House, Parma’s oldest surviving house, has stood at the northeast corner of Broadview and Rockside Roads. It was 1841 when immigrants from Bavaria, Germany, Philip and Sophia Henninger, married and built their log cabin and barn in a farming community on Town Line Road (now Broadview Road) in Parma Township. Near a stream (now West Creek), meandering down the slope to the Cuyahoga River, the site afforded a superb view of Cleveland and Lake Erie. With five children born between 1842 and 1848, the Henningers had outgrown their log cabin. 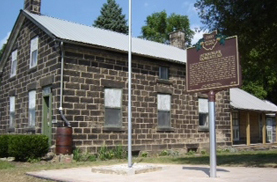 So, in 1849, using sandstone from their adjacent Henninger Quarry, Philip Henninger built the house that stands today. The years passed. But through four generations, the Henningers remained in their stone house at 5757 Broadview Road, until 1988 when Janice Henninger Sheets was married and the historic Henninger House became vacant. Abandoned, neglected, decaying, for sale, and almost forgotten, the Henninger House seemed destined for demolition when the Parma Historical Society initiated a 1994 levy in an effort to save it. The levy failed, but the Henninger House remained… empty and unsold. It was Parma Councilman Tim DeGeeter who in 2001 spearheaded a renewed interest in preserving the Henninger House by designating the neighborhood as a “Quarry Creek Historic District” encompassing a 14-acre city-owned parcel along West Creek. DeGeeter, now Parma’s mayor, encouraged a focus on projects and historic landmarks to reclaim Parma’s heritage. With grass-roots partnerships that included West Creek Preservation Committee, now West Creek Conservancy (WCC), the City of Parma, the Trust for Public Land, the Henninger Task Force, and the Parma Historic Society—the campaign to save the Henninger Homestead was under way. And it succeeded. A total of $470,000 was raised through grants from the Northeast Ohio Areawide Coordinating Agency, the State of Ohio, the Ohio Historical Society, and the City of Parma, through significant contributions from General Motors Corporation and Forest City Enterprises, and from over $30,000 in donations from local residents and businesses. With demolition permits already issued and only hours to spare, the Henninger House was saved when the Trust for Public Land, working with the Parma Law Director, negotiated the April 4, 2003, sale of the 1.5 acre Henninger Homestead with the descendants of Philip and Sophia Henninger for $400,000. The property, including both the Henninger House and Philip Henninger’s original barn, Parma’s oldest standing structure, is now owned by the City of Parma with a conservation/historic easement held by West Creek Conservancy. With the site secured, the focus shifted to preservation and restoration of the structure. A $27,000 Ohio Historic Preservation Office grant was used to stabilize the entire Henninger House and repair two chimneys (and fully rebuild one). To reduce moisture in the house, the job of tuckpointing was financed with another grant of $19,500 from the Ohio Historic Preservation Office. To further protect the house from damage, WCC worked with the National Park Service (NPS) to install a temporary roof, with the NPS donating more than $7,000 in labor. More recently, volunteers assisted with two porch renovations and general cleanup. In 2006, WCC purchased property that extends north from the Henninger House, along the Parma-Seven Hills boundary, to Brooklyn Heights Park. This acquisition is a beautiful stretch of land with numerous hardwoods, protecting a significant tributary of West Creek. On September 14, 2013, West Creek Conservancy hosted a ceremony at Henninger Homestead to dedicate the site’s newly installed Ohio Historical Marker, with inclusion on the National Register of Historic Places. Featured speakers at the dedication ceremony included Parma Mayor Tim DeGeeter, Cuyahoga County District 4 Councilman Chuck Germana, Founder of WCC Dave Vasarhelyi, and WCC Executive Director Derek Schafer. Henninger family members were present and shared their memories of family life at the homestead. Still residing in Parma, Janice Henninger Sheets, age 92, who was born in the home, offered personal insights of events that took place when she lived in the house. Still in early stages of renovation, the homestead is in need of much more restoration before it can be transformed into a community space featuring a new Visitor Center, trailhead, and picnic area along the West Creek Greenway—a proposed hike and bike trail network linking the Cleveland Metroparks West Creek Reservation to the Towpath Trail in Cuyahoga Valley National Park.